Whether it’s football, art, BBQ or ghosts, competition is king on both sides of the Black Warrior River this weekend. The 37th Annual Kentuck Festival of the Arts kicks off its all-encompassing 2-day celebration of Southern Folk Life tomorrow (10/18) in Northport’s Kentuck Park. Nestled on the banks of the Black Warrior River, under a cool canopy of tall trees, the festival offers a feast for the eyes, ears and palate, and a gentle alternative to the rammer jammer mayhem of UA game day over in adjoining Tuscaloosa. WHY GO: Kentuck is Alabama’s most notable arts festival. It’s been named a Top Twenty Event by the Southeast Tourism Society, has received the Alabama Governor’s Arts Award, and has been designated a “local legacy” by the U.S. Library of Congress. 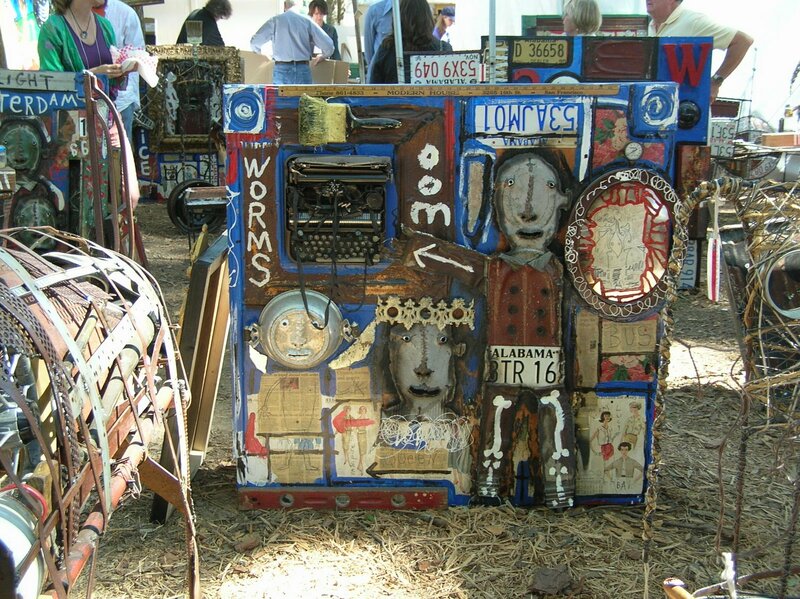 The festival boasts over 250 invited folk and visionary artists from across the country and celebrates both traditional Southern folk art and emerging American craft artists. Browse, buy, and learn across all mediums – from painting, pottery, and assemblage, to quilting, sculpture and basket weaving, to name a few. Kentuck For Kids keeps the little ones engaged with hands-on craft demos and a petting zoo, among many other activities. Kentuck gives a nod to Alabama’s esteemed literary history with an appearance by West African storyteller Diane Williams. Two stages of music feature a variety of complementary genres from Cajun and blues to jazz and folk, welcoming such national and regional artists as Afrissippi, the Figs and Willie Sonny Boy King. In addition, food vendors will offer an assortment of local and ethnic specialties. GETTING AROUND: With annual attendance estimated at 30,000 visitors, as well as the Crimson Tide hosting Ole Miss (along with 92K+ football fanatics) on 10/18, it may be slow–going getting around in this small enclave. Festival organizers provide shuttle bus service to Kentuck Park from several key locations around town. ROLL TIDE: Although the Cotton Bowl champion University of Alabama Crimson Tide football team is playing at home this weekend, good luck gaining entrance into the house that Bear built. Win or lose, that ticket stays hot, and the tide is on a winning roll right now!! Join the revelers on the green and around the stadium for pre and post game tailgating. In between time, head over to Wings, owned by Bob Baumhower, an All-American from the University of Alabama and 6-time All-Pro for the Miami Dolphins, for traditional sports bar cuisine and “lots of screens.” A smaller, but no less raucous, option is Tuscaloosa’s favorite hole-in-the-wall, Egan’s. In the shadow of Bryant-Denny Stadium you can savor the Tide’s victorious past at the Paul W. Bryant Museum. 13 GHOSTS: Not haunted by the “Bear?” Real ghosts await at the Drish House, an endangered landmark and one of Alabama’s most famous haunted houses. Another bloodcurdling year is planned for the United Cerebral Palsy’s Fright Factory which is now located in an old Winn-Dixie. Got skeletons of your own? Head down Hwy 69 to visit with psychic reader Mrs. West. ROLLING ON THE RIVER: With all this back and forth across the river, it may be high time to get out on the Black Warrior. The Bama Belle, a romantic paddlewheel replica, sails on Saturdays at 1PM from April thru November. SLEEP: While the area has lost its only 2 B&B’s over the past 3 years it has gained 5 new chain hotels, but good luck scoring a room. Football weekends sell out early even with prices raised double and triple their normal rate! Rumor has it though that the newly renovated Home-Towne Suites had a block of 60 rooms available as of close of business last night (10/16). EAT: For me, breakfast at the Waffle House is mandatory during any trip below the Mason Dixon line. Grub out on a soft, thin, crispy waffle dripping with butter and syrup, eggs, cheese grits, and hash browns – scattered, smothered, covered, chopped, diced, peppered, capped or topped. If you’ve got a taste for amazing biscuits, the locals flock to The Waysider to get their fix. BBQ BATTLE: “Ain’t nothing like ‘em nowhere” is the motto at the legendary Dreamland Bar-B-Que which has been serving up ribs and sauce since 1958. The location in Tuscaloosa is argued to be “the best,” but the Northport spot has a wider variety of menu options. Wear a bib ‘cause you’re definitely gettin’ some on ya! (Me and my favorite baby blue shirt learned that the hard way). For fine dining and a selection of award-winning wines, try the Globe restaurant in downtown Northport for an eclectic and Shakespearian inspired menu (i.e. Twelfth Night Trout, the Much Ado club).